High Temperature Electronics require innovative thermal management devices. Copper water heat pipes are a well-established solution for many conventional electronics cooling applications; however they have several problems when applied to high temperature electronics. The high vapor pressure of the working fluid combined with the decreasing strength of an already soft material leads to excessive wall thickness, high mass, and an inability to make thermally useful structures such as planar heat pipes (vapor chambers) or heat pipes with flat input surfaces. Recent work has shown that titanium/water and Monel/water heat pipes can overcome the disadvantages of copper/water heat pipes and produce a viable thermal management solution for high temperature electronics. A study has shown that water remains the fluid of choice due to its favorable transport properties. Monel and titanium offer much higher strength and result in reasonable wall thickness and mass. Testing has shown compatibility at high temperature. 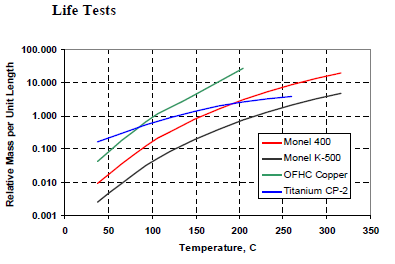 Presented in this paper are a survey of potential replacement fluids, results from high-temperature life testing of water in Monel and titanium envelopes, and comparison of mass and performance with competing approaches such as copper/water. Conventional silicon-based semiconductors are limited to junction temperatures of about 150°C or less. Given a finite junction-to-case resistance, thermal management solutions for such devices are typically required to function between room temperature and about 120°C. In the case of phase change devices such as heat pipe and vapor chambers, the material system of choice is copper/water. In that temperature range water has the highest figure of merit, or the best combination of surface tension, latent heat, and vapor density. Copper has high thermal conductivity and reasonable strength at the required operating temperatures, which leads to thin walls and low temperature drops. Compatibility of the copper/water heat pipes is also well established, with some work going back nearly 40 years . Finally, it is possible to produce a variety of useful wick structures in copper/water heat pipes, including sintered powder, extruded grooves, and circumferential screen wicks. Copper/water heat pipes are a much less satisfactory solution for high temperature electronics, or those operating at temperatures of 200°C or higher. The major problems are mass, strength, and working fluid vapor pressure. Copper loses strength quickly with temperature and the working fluid vapor pressure rises exponentially. At 200°C the yield strength of copper has fallen to 50% of its room temperature value while the working fluid vapor pressure has gone up almost 500-fold to 200 PSI. At 250°C the yield strength has fallen even more and the vapor pressure is over 500 PSI. This requires very thick, and consequently very heavy, heat pipe walls for sufficient strength. It also makes some structures, such as flat heat pipes or the so-called vapor chamber design, impractical or expensive due to the very thick walls needed or the need for elaborate and costly internal bracing to prevent bowing of the contact surfaces or rupture of the walls. Two alternatives are high-strength wall materials and replacement working fluids. Candidate wall materials include titanium and monel. Life testing has shown long-term compatibility between those two materials and water working fluid. The production in these materials of all of the conventional wick structures including grooves, sintered powder, and screen, extends the useful range of water by providing a strong but light containment for the high vapor pressure with heat pipe performance and life equivalent to copper/water. Replacement working fluids can circumvent the need for a high-strength wall material. 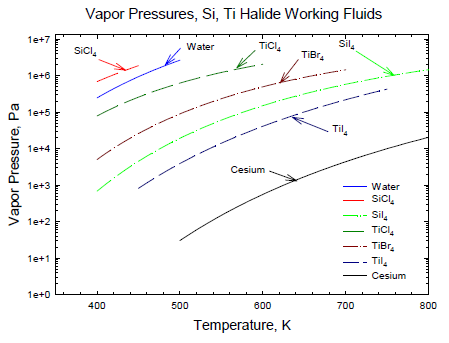 Materials such as halide salts and phenols have vapor pressures at least one order of magnitude lower than water at temperatures over about 150°C. They can also allow the use of thinner and subsequently lighter wall materials, such as stainless steel or potentially aluminum. A survey of candidate fluids has been completed which compares the vapor pressure and merit numbers with water. Monel 400 and Monel K500 are two other potential heat pipe materials (Monel 400 Technical Bulletin, 2005, Monel K-500 Technical Bulletin, 2005). Monel 400 is a solid solution alloy with roughly 63% nickel and 30% copper. It is a single phase alloy, since the copper and nickel are mutually soluble in all proportions. It can only be hardened by cold working. Monel K500 is a similar nickel-copper alloy, with the addition of small amounts of aluminum and titanium that give greater strength and hardness. The system is age-hardened by heating so that small particles of Ni3(Ti, Al) are precipitated throughout the matrix, increasing the strength of the material. The material must be annealed beforewelding, for ductile welds. 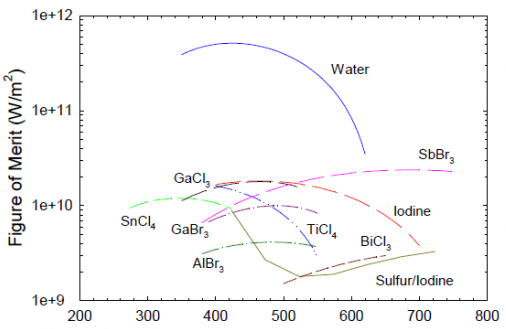 The relative unit mass values for copper, monel and titanium are plotted below based on the vapor pressure of water. 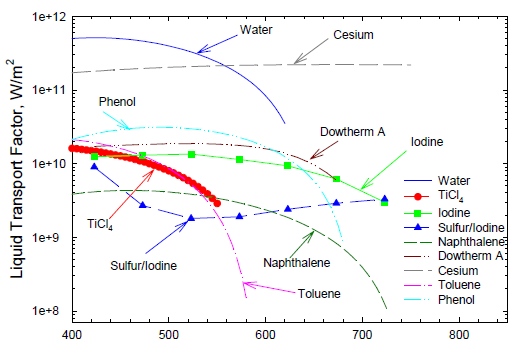 That plot shows that Monel and titanium result in lighter heat pipes than copper. Moreover, monel and titanium have higher maximum operating temperatures because the strength of copper falls more quickly as temperature increases. 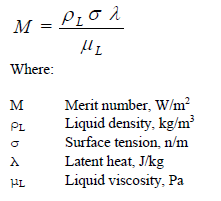 A relative mass calculation for heat pipes with flat surfaces such as the so-called vapor chamber is slightly more complex but yields a similar result. Life tests are required to verify that the heat pipe envelope, wick, and working fluid are compatible for the potentially long operating life of a heat pipe. The two major consequences of incompatibility are corrosion and the generation of non-condensable gas, or both. The resulting corrosion products can block portions of the wick, preventing the heat pipe from operating properly. In more extreme cases, the heat pipe can leak. A series of simple cylindrical heat pipes were constructed and operated to demonstrate compatibility with the wall materials and working fluid. 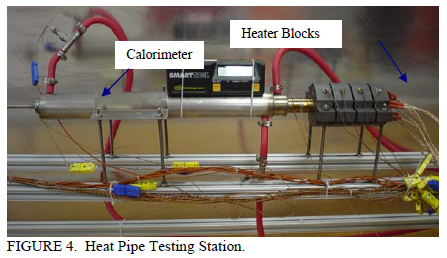 These life test pipes were electrically heated and had three thermocouples to monitor the temperature gradient along the heat pipe. Any incompatibility would result in the generation of noncondensable gas, which would then accumulate in the heat pipe condenser and result in a cold end or increased end-to-end temperature gradient. The heat pipes were operated at either 227 or 277°C to accelerate any reaction between the wall and working fluid. Once weekly the input power was reduced so that the heat pipes operated near 60°C. This reduced the vapor pressure of the water from roughly 60 atm (277°C) or 26 atm (227°C) to only 0.2 atm. That allowed any noncondensable gas present to expand and cover more of the condenser so it could be more easily detected. The titanium heat pipes all generated gas initially. This was believed to be a result of a passivation process that produced titanium oxide on the surface of the heat pipe. The gas was removed from all of these pipes by heating to about 115°C and venting them. The thermocouples are monitored to verify that the non-condensable gas has been forced out of the condenser by the pressure difference. The heat pipe fill tube is then resealed. operation, a few of the CP-titanium pipes started to develop additional non-condensable gas. The pipes were just recently vented for a second time. The reason for this second gas buildup is currently under investigation. A variety of wick structures have been produced in both titanium and Monel. Shown in Figure 3, the simplest wick structure is a layer of screen that was spot-welded to the interior wall of the heat pipe. 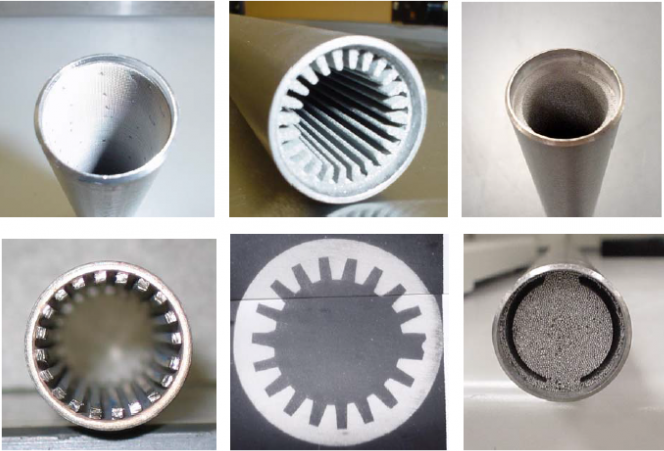 Sintered powder metal structures include plain circumferential wicks, axial grooves produced from sintered powder, and a so-called slab or I-beam wick which consists of a circumferential wall wick and a large central slab in the center of the heat pipe. The slab wick is a practical structure when vapor pressure and density are high. Only a small amount of area is needed for vapor flow, so the rest of the heat pipe section can be dedicated to liquid flow. Both sintered and solid axial grooves have been produced in titanium and monel heat pipes. Sintered axial grooves both enhance fluid flow in the heat pipe condenser by reducing pressure drop and increase heat flux capability in the evaporator by serving as extended surfaces. One of the methods used to produce the solid axial grooves can result in grooves with tapered sidewalls as show in the cross-section. This can provide freeze tolerance by allowing solidified working fluid to eject itself from the grooves. A representative titanium/water heat pipe with a sintered powder wick has been assembled and tested. That heat pipe was 24” long and ¾” diameter with a 0.049” thick wall. It has a 6” evaporator and a 16” condenser. The wick was a simple cylinder 0.14” thick that was sintered from -35+65 mesh spherical titanium power. Figure 3: Survey of wick structure produced in titanium and monel which shows equivalence to structures currently produced in copper. controlling the ratio of argon and helium (with different thermal conductivities) in a gap between a jacket of cooling water and the condenser. 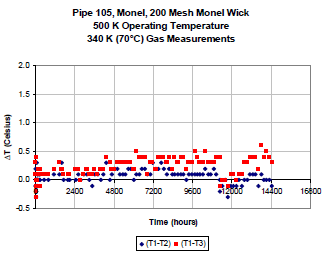 Heat pipe temperatures were measured by an array of thermocouples attached to the heat pipe wall. Power in was measured by a wattmeter connected to the cartridge heaters. Power out was computed from the fluid flow rate and temperature rise through the condenser calorimeter. temperature and the test repeated. The results are plotted in Figure 5. That shows the actual test data as individual points and predicted performance as lines of constant inclination against gravity as predicted by an in- house model. The heat pipe met performance predictions at lower temperatures and exceeded the predicted values in the higher temperature range. The recent heat pipe development work and life tests discussed above show that water working fluid in titanium or Monel heat pipes is an excellent device for cooling electronics at temperatures up to 275 C. As the temperature gets closer to the critical point of water (374 C), the vapor pressure becomes too high, and the surface tension too low, for water to be suitable as a working fluid. For very high temperatures (above roughly 450 C), cesium and other alkali metals can be used as the heat pipe working fluid. Alternative working fluids are currently under investigation for the temperature range from 150 C to 450 C. In addition to high temperature electronics cooling, other heat pipe applications include spacecraft radiators, fuel cell thermal control, and waste heat recovery systems. Many other working fluids are available which have lower vapor pressure, including mercury, Dowtherm fluids, sulfur/iodine mixtures, Napthalene, Phenol, Toluene, and a variety of halide salts (Anderson et al., 2004, Deverakonda and Anderson, 2005). 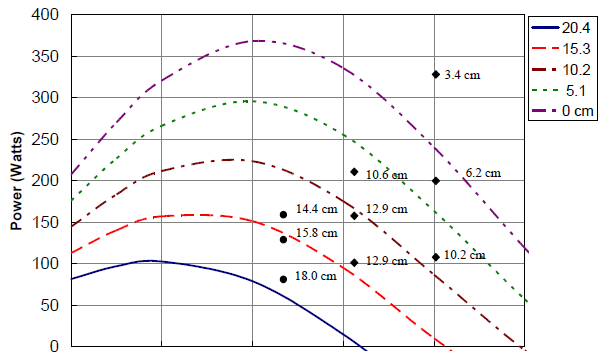 The results are shown in the following plots. Figures 6 and 7 compare the vapor pressure of water with several candidate replacement fluids. Virtually all of the fluids have a lower vapor pressure than water, and many of them are an order of magnitude lower. Mercury and cesium are shown only for comparison; mercury is not being considered because it is toxic and because it is difficult to make it wet screen, much less other wick structures such as sintered powder. Figures 8 and 9 compare the figure of merit of the replacement fluids with water. 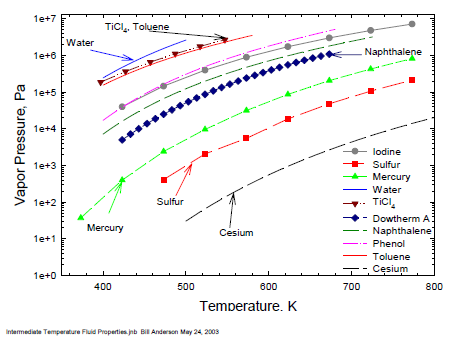 Although water is clearly higher in most cases, at higher temperatures Dowtherm, naphthalene, and phenol continue to be useful past the critical point of water. These fluids are currently being qualified by life testing for high temperature electronics cooling and other applications. Two alternatives to copper/water have been presented. The first, high strength wall materials, offers the same performance as water but in high strength materials that allow operation at higher temperatures. Indications of maturity were presented, including life test data, the existence of suitable wick structure, and the ability to fabricate heat pipes and predict their performance accurately. Titanium/water and monel/water heat pipes can be considered a mature or mainstream technology that is ready for widespread application. The second alternative presented was replacement working fluids. These offer good thermal performance but at much lower vapor pressures and offer the potential of using low-mass wall materials such as aluminum or thin stainless steel. 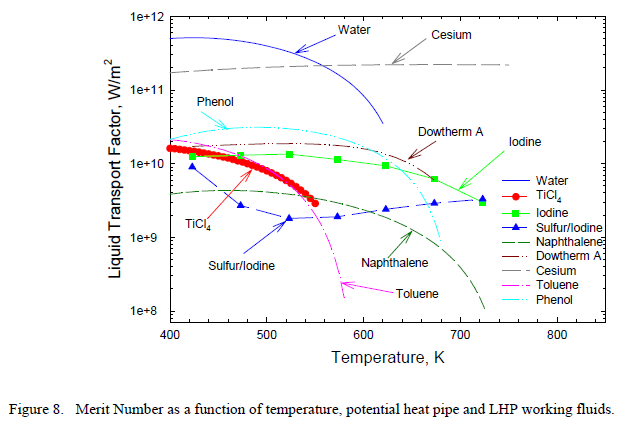 This alternative is less mature, however, and will require additional work to fully characterize the thermodynamic properties of some of the working fluids and to identify envelopes with long-term compatibility. Either of the two alternatives can offer a solution for cooling high temperature electronics, or those working at or above 150°C. Use a Constant Latent Heat (At the Normal Boiling Point). Since Their Critical Temperatures Are Not Known. Much of the work presented in this paper was sponsored by NASA Glenn Research Center under contracts NNC04CA32C and NNC05TA36T. Duane Beach was the technical monitor. David Glatfelter and Rodney McClellan of Advanced Cooling Technologies were the principal technicians for the work described. They fabricated and tested the life test heat pipes and conducted the wick development work.